India has been actively mediating peace talks to end clashes in northern Myanmar recently. According to an Indian Express report on Monday, New Delhi has agreed to arrange Myanmar ethnic rebel leader's visit to India and sent representatives to negotiate with the Myanmar government and ethnic armed rebels. India enjoys favorable geographical conditions and a shared ethnic heritage in helping northern Myanmar's reconciliation. Northern Myanmar lies between India and China, connected by the Stilwell Road, which was built during World War II. The road is still a significant transportation channel until today. A large number of Chinese products are transported to the port markets of India-Myanmar border through this road. Ethnic minorities in this area span all the three countries. For example, Kachin, the main ethnic minorities in Myanmar's Kachin state, could also be found in India's Assam state as well as China's Yunnan Province. Of course, self-interest is one of the main reasons why New Delhi is willing to push peace talks in northern Myanmar, because stability in this area is directly related to stability in northeast India. In recent years, India has often suffered from Myanmar's ethnic conflicts in the country's northeast. In 2012, an estimated number of 100,000 Chins seeking refuge flocked to the Mizoram state of India. Besides, India itself also faces severe challenges from the separatist activities of minority extremists in the northeast. If northern Myanmar could be secure and stable, it could help strengthen security cooperation between the two countries. Moreover, if India could play an important role in maintaining stability in Myanmar, it can encourage China to make more efforts in this field, and enhance mutual trust between China and India. The negotiations over Sino-Indian border dispute are struggling forward, and the main factor that affects the process is the low-level of mutual trust. In this context, if the two countries could coordinate to make some progress in the northern Myanmar peace talks, mutual understanding between Beijing and New Delhi will be increased, which could benefit the negotiations over border disputes between the two. China and India are not only close neighbors, but also fellow member states of BRICS. Now that the two have already established some cooperation mechanisms, and further enhancing collaboration under the framework of BRICS is also under way. However, both China and India still need to play a bigger role in regional affairs, which requires the two sides to enhance their coordination. In such circumstances, promoting the peace talks in northern Myanmar is an exploration for building up cooperative mechanisms. India's ability at mediation is probably weaker than that of China. But as long as India is willing to make efforts, China should respond positively by creating conditions and increasing information exchanges with India. China is carrying forward the "One Belt, One Road" initiative, which includes the Bangladesh-China-India-Myanmar Economic Corridor. The initiative is not only an economic task, but also a diplomatic mission. To achieve the goal of implementing this project, there is lots of concrete and detailed diplomatic work to do, including enhancing communication and coordination in the region, in order to solve problems and build a stable and peaceful mechanism based on consultative democracy. India chooses to mediate the clashes in northern Myanmar at this point, not only for its "Look East" policy, but also that India has realized Myanmar's intent to strengthen ties with India. An enhanced relationship between India and Myanmar should not be regarded as a constraint on China-Myanmar relations, even if the Myanmar government is considering balancing China's influence. We should have the self-confidence that small and medium-sized countries in Asia, such as Myanmar, need China in their development. 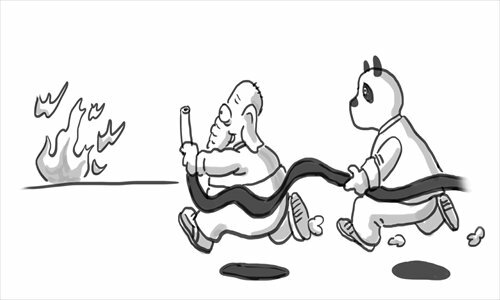 China should learn to adapt to Asia, which is constantly looking for a new balance with the rise of China. For example, gradually eliminating India's mistrust about cooperating with China is a wise move. Like to share these types of blog to my friends who like to read the blogs for gaining good thoughts and informations. You can hire this munnar call taxi for any tours and travels program of your family. They are providing secured and comfortable cabs.